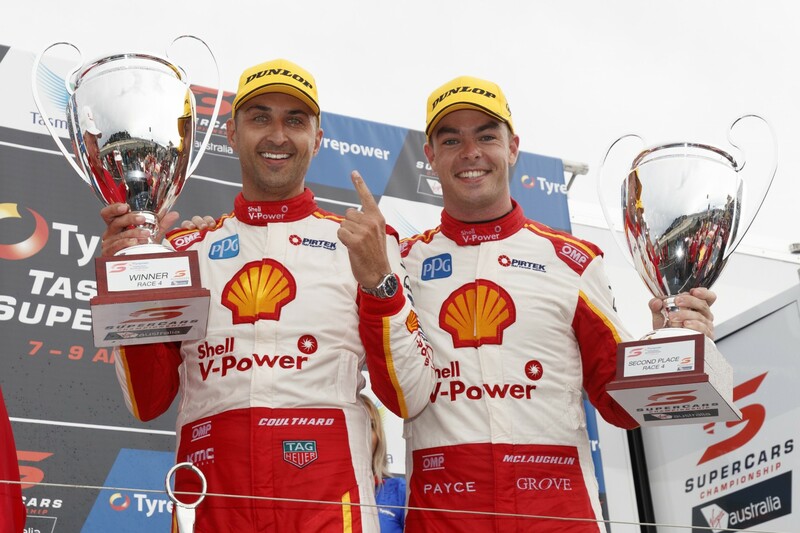 Fabian Coulthard says he’s had to raise his game this season in order to beat new team-mate Scott McLaughlin. Coulthard, 34, scored Shell V-Power Racing’s first Virgin Australia Supercars Championship race win by leading home McLaughlin on Sunday. The result marked the first win for Coulthard since March, 2015, where he piloted a Brad Jones Racing Holden to victory in Adelaide. Winning at Symmons Plains follows a podium for Coulthard at this year’s Clipsal 500 and victory in two of the four races at Albert Park. Sitting second in the championship, two places ahead of McLaughlin, is a strong start from Coulthard following an off-season filled with hype of the youngster’s arrival. Seen by many as the sport’s next champion, attention on McLaughlin’s arrival was heightened by star engineering recruit Ludo Lacroix being placed on the #17 car. Although brushing off suggestions he entered the season in McLaughlin’s shadow, Coulthard says he’s benefitted from working alongside the 23-year-old. “Scott has definitely been pushing me,” said Coulthard. “It’s definitely made me raise the bar for my own personal achievements. “We’ve worked really well as a team. Scott has been at the shop a lot and we’ve got a really good team environment with the engineers, we’re all working together. “If there’s hype about Scott it’s no different to the hype around me when I joined the team this time last year. Performing at Symmons Plains removed any doubts over whether the Shell Ford squad has a package with which it can contend for the championship. On a circuit where Coulthard and former team-mate Pye struggled in 2016, the team proved quick in wet and dry conditions throughout the weekend. “We really struggled here last year,” recalled Coulthard. “Scotty (McLaughlin) was fortunate that he didn’t have to drive that car here! “This weekend he had an unbelievable car in the wet and my car was good in the dry. “It worked in my favour obviously with the way the weather went on Sunday. “From here we’ll just keep improving our car week in and week out.